Shenandoah National Park is a long and skinny park. The Skyline Drive runs its entire length of 105 miles. For most of it, the road is never more than a few miles from the park’s boundary on both sides. For this reason, besides the Appalachian Trail that closely parallels the Skyline Drive, there are few hikes in the park that aren’t short. 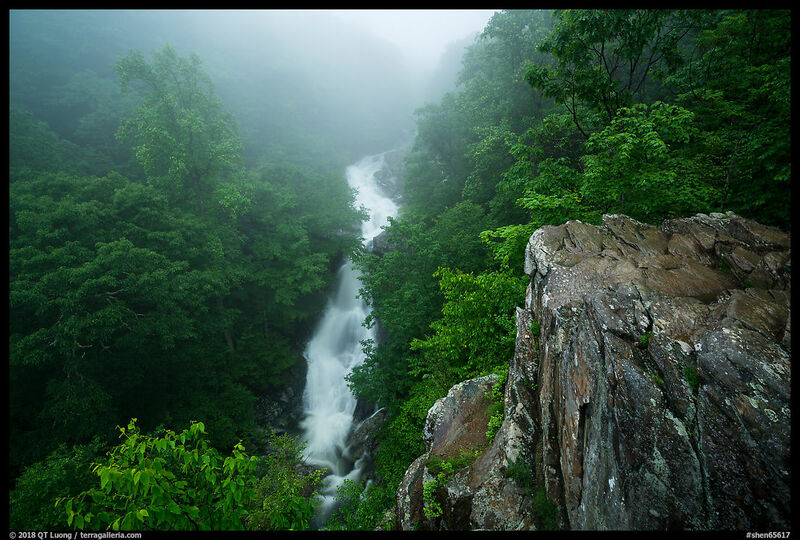 The two best ones are the Old Rag Loop (8.8 miles, 2,400 ft elevation gain) which offers great scrambling and views, and the Whiteoak Canyon/Cedar Run loop (8 miles, 2,750 ft elevation gain). 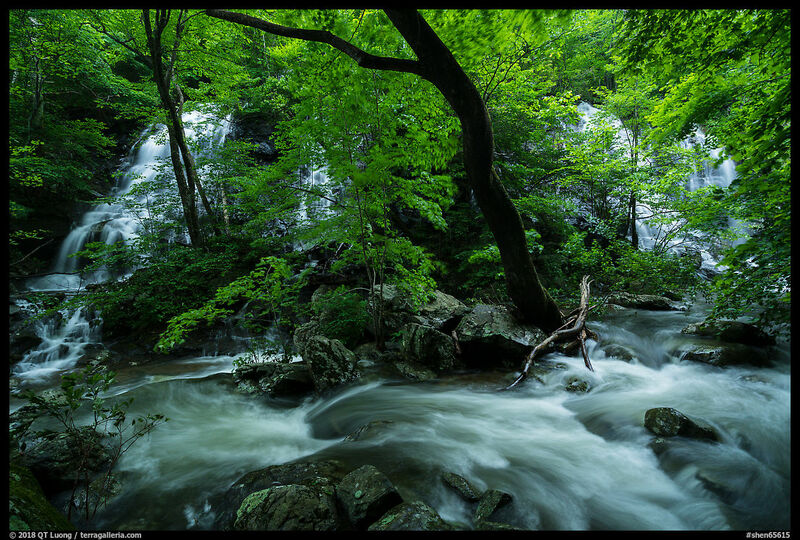 The later combines two hikes: the Whiteoak Canyon, a steep gorge with six waterfalls, has been called the “scenic gem” of Shenandoah, and along Cedar Run, two more waterfalls can be seen (NPS map). During my autumn trip to Shenandoah, water levels were quite low for a waterfall hike, but last spring, conditions looked wet enough. Stopping at the visitor center for unrelated information, I thought I might as well ask for trail conditions. I was glad I did, when I was told that there was so much water that the connector between Whiteoak Canyon and Cedar Run was entirely flooded. Starting from Cedar Run, I might have never made it to Whiteoak Canyon. Instead, I changed my plans to hiking Whiteoak Canyon as a out-and-back hike. Always a good idea to do a last minute check with the rangers! The Whiteoak Canyon Trail was quite wet from the start. Hiking became easier after I gave up on trying to keep my feet dry by avoiding the puddles – I had packed two pairs of shoes for my trip. The trail at first doesn’t follow the river, and the sun was still quite bright, so I didn’t photograph much until the bridge over the Robinson River, about two miles from the trailhead. Those bridges always provide interesting vantage points. I waited for a bit of cloud cover to soften the light and reduce the bright spots. Stream and waterfall images are all about the flow, and there is nothing like bright spots and shadows to interupt it. Compared with the photograph I made on the way back at dusk, the afternoon image with some hints of sunlight was more lively. Always a good idea to photograph in different light conditions! After the bridge, the trail mostly followed the Robinson River, providing numerous compositions. 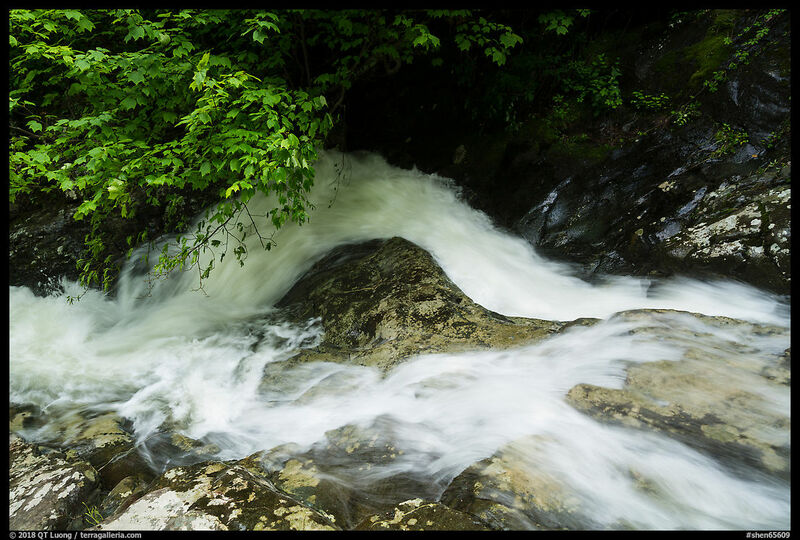 Despite the length of the hike, I made sure to carry my tripod to be able to use a range of shutter speeds because water would be a primary subject. Photographing backlit made the leaves glow a fluorescent green. Since I wanted a slow shutter speed to blur the water, I had to wait for a lull in the breeze so that the leaves would not be blurred. 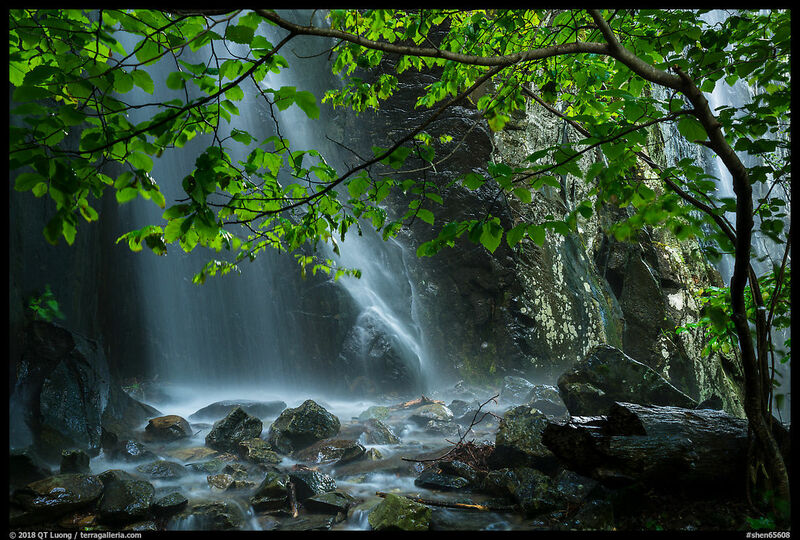 Although the cascades and waterfalls over Robinson River are the main attraction in Whiteoak Canyon, because of the wet conditions, water was flowing everywhere (including on the trail), creating ephemeral waterfalls of more delicate beauty than the main stream. Finding it more exciting to try and capture the transient, I made sure to look around. 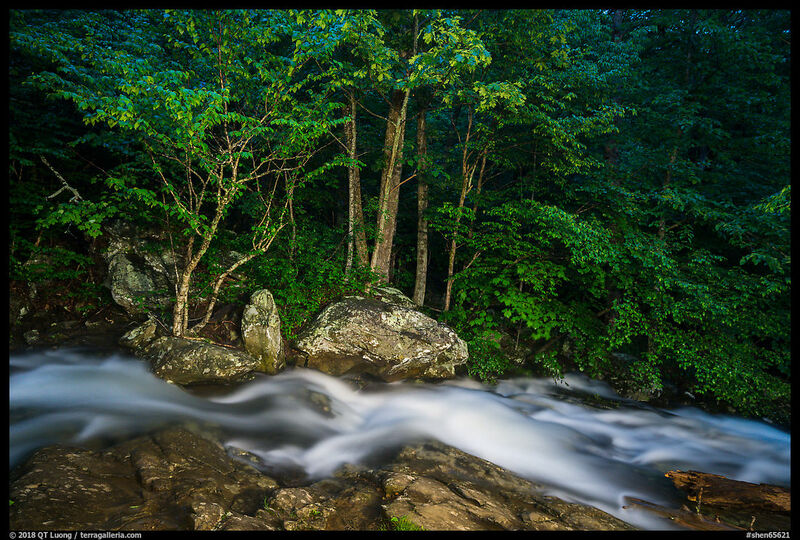 Although a (variable) neutral density filter is ideal for photographing streams, it is not necessary. When the water is not in direct sunlight (a situation to be generally avoided), using a polarizing filter and stopping down gets me shutter speeds which are slow enough to blur the water. By varying aperture and ISO, it is possible to get a range of shutter speeds. Digital photography is particularly great for photographing water because you can experiment with shutter speeds and get immediate feedback. Some scenes look better with the water entirely smoothed, for some it is preferable to freeze the motion a bit, and often a combination of both in a single frame gives the most dynamic result. 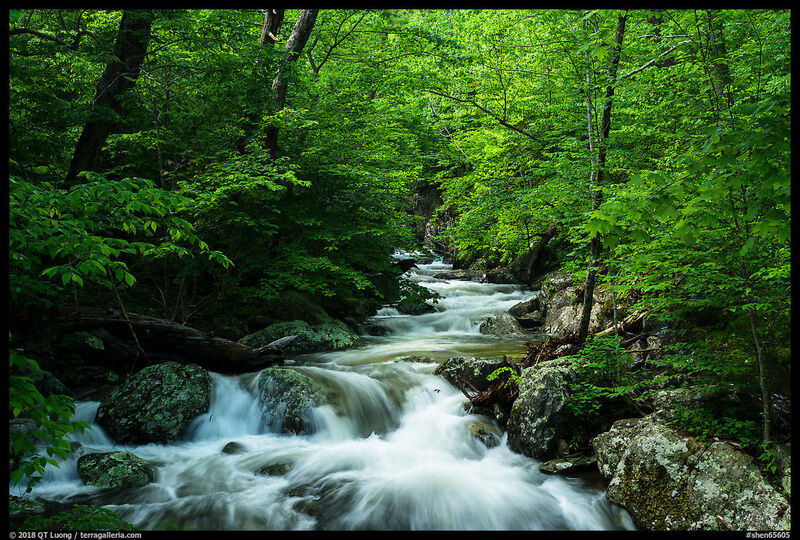 As with all river hikes in Shenandoah National Park, you start from the ridge (elevation 3,385 ft), and the sound of the waterfalls entice you to hike further and further downhill. Remember you’ll have to work your way up. 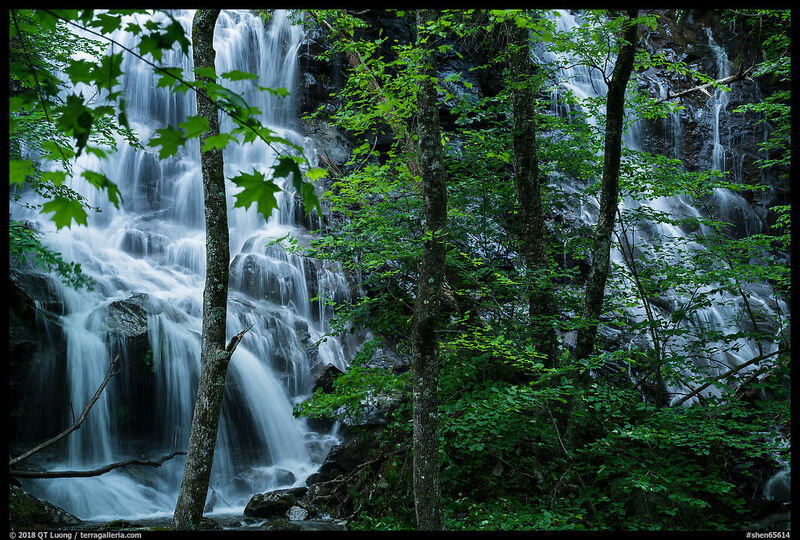 My favorite part of Whiteoak Canyon was an off-trail point at about three miles, elevation 1,750 ft, where several branches of the stream converge, forming a striking wall of waterfalls. 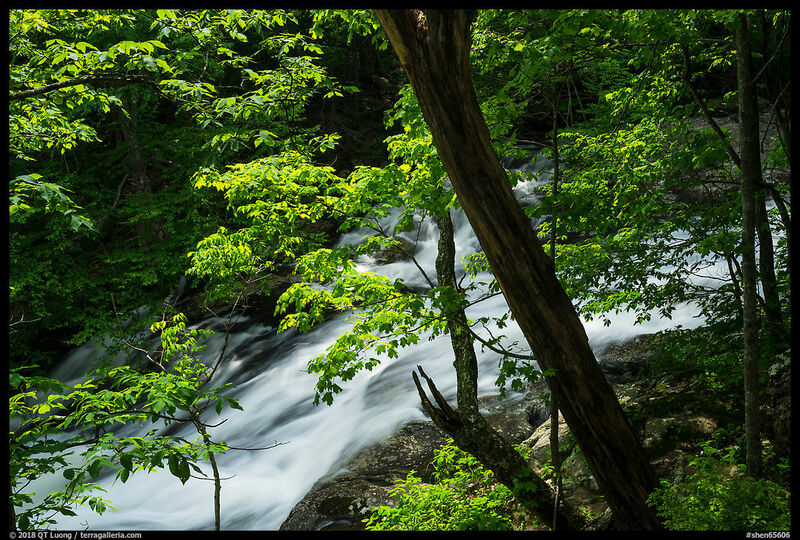 In this photograph, the role of the polarizer was to increase contrast between the whitewater and the darker, more smooth sections of water, as well as increase the saturation of the leaves, rather than slowing down the shutter. Instead, at base ISO it resulted in a shutter speed which was a bit too low for the effect I preferred, so I raised the ISO. On my way back, I detoured again to a rock ledge a short distance downstream from the bridge that provides a fine and vertiginous view of the upper falls, the only such large scene along the trail. In the afternoon, the waterfall was in the shade, but the surrounding trees and cliff were sunlit. Now the scene was softly lit, with a bit of fog providing some atmosphere. Even though a loop can be a more satisfying experience, revisiting a scene on an out and back trail even within a few hours pays. Further back, I had spotted a smaller river scene along the trail, but the afternoon light wasn’t favorable. Since it was now dark, I was able to illuminate the scene with a flashlight (described here) creating even light that appears at first like sunshine, but without the distracting shadows that would have resulted from sunshine. Darkness is not a reason to stop photographing.